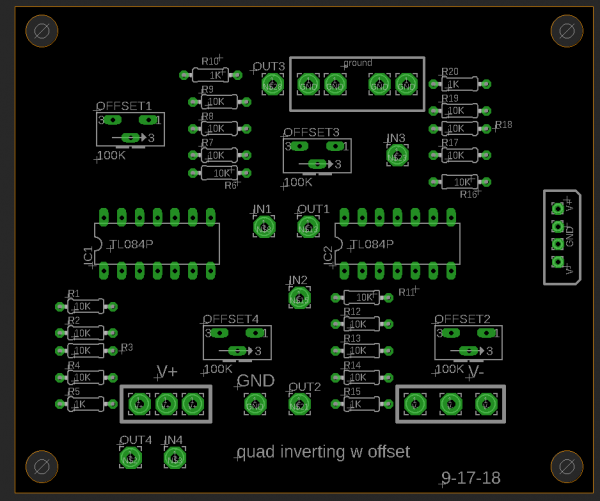 Custom PCB, 2 quad op amps used for 4 buffers, each with independently adjustable gain and bias offset. I already built this twice (no errors I could find) and have posted 2 different designs. Audio demo as well in 3rd link. when ur want to use this also for protecting cmos of negative voltages, may diodes on the output would protect even more? or have two outputs per channel, one with and one without diode protection. Good point. To protect vs. negative voltages, just thinking out loud: perhaps you could power the board from GND to V++ instead of V++ and V--? 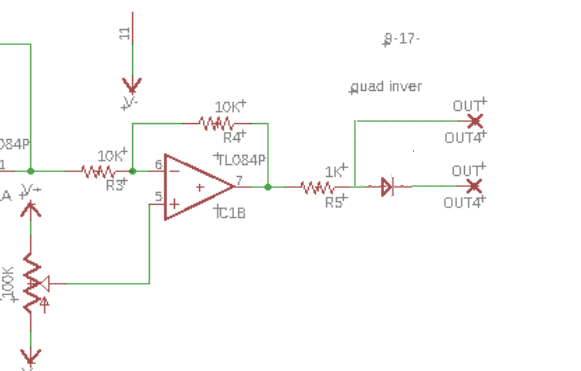 And maybe use Rail to rail quad op amps vs. say TL074? Suggestions for negative protection are indeed needed--what does the group think is the best way? Link anyone? 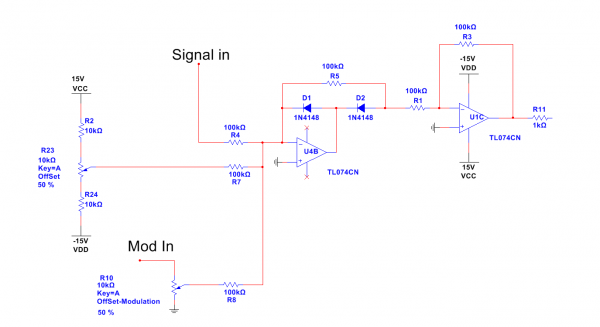 This certainly comes up with getting signals into MPU like Arduino. You don't want high current V- for that. Zeners? 4148's? Something else? I have seen a lot of circuit clamp fragments but don't know what works best. For many applications that won't matter, but sometimes it will. Assuming we do see that, I'd need the voltages pass through unencumbered. Same for signals coming into the buffer. 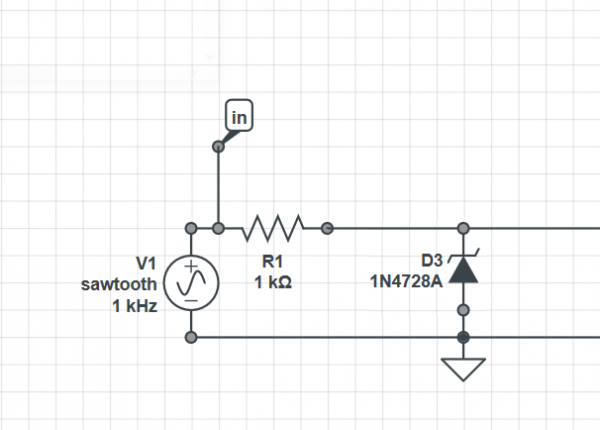 I am trying to figure this out, since I will be using 4066 and 4053 on an upcoming project and the voltages are driving some sensitive gear. dunno but may the precisicion-rectifier could help you? there u dont have to deal with the voltage drop. as an example i did a simulation with 1Vpp input. if so, than moving the offset to the first stage would make sense. How about a Zener? The signal will not exceed the zener rating (right?) it does go a diode drop below ground--OK in my case--gets the basic job done with 2 parts. Hey Charlie, I have no idea on how to protect it, but I have recently discover your audiowhy blog and Im totally addicted to it... I just had to say it loud. Thanks so much Mapache. I really enjoy writing it. Ha! Thanks gabba, great link! I will try to breadboard it this weekend. Hi Gabba, no surprise, my sim works like yours. 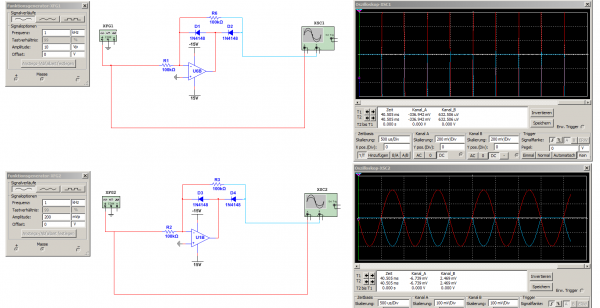 The precision rectifier preserves "top" of waveforms accurately, but dips below 0V by a diode drop. The zener one I showed clips the top but still has the same diode drop below 0 for anything that goes negative. Both are subject to temperature variation, since diodes can be temperature sensitive. Not sure how to get rid of those dips below 0. There has to be an easy way, but so far I can't figure it out. maybe I'll just tell the Arduino to eat what's below 0V.